It was a very beautiful morning when we went for the lunch invite at Peach Blossoms. The good news is that Peach Blossoms has launched their new set menu with some of their perennial favourites as well as new creations. Promotional Set Menus are launched on a monthly basis with the focus on Barbequed Peking Duck (March) and Boston Lobster with 7 variations of cooking style (April). I thought I was very early to reach before noon. There were already two small tables of corporate diners before me. Let’s take a look at the yummilicious creation we tried! The 4-item dimsum starter for this month’s Set Menu was pleasing to the palette and went very well with the Pu’er tea we had. Every piece was exquisitely handmade and distinctively special with it’s own flavour. This crispy roasted duck with crepe, cucumber, scallion and thick, fragrant sweet sauce is on this month’s promotional menu as part of a set of 8 gastronomic delights. Alternatively, the big fat Peking Duck can be ordered as an ala-carte item at ONLY $48++ for now. So good deal hor! Don’t say bo jio! The individually-served bowl of clear soup smelled of heavenly aroma. I’m a soup lover who spares no expenses over soup ingredients. Brought up the Cantonese way under my mum’s influence, I appreciate a hot bowl of soup when it comes to dining. However, the soup I make at home (although is very good too) can in no way compare to the standards at Peach Blossoms even though I slow-slow-boil over the stove for hours. At Peach Blossoms, they double-boil it for even longer hours hence I believe that is the way to seal in all the best flavour. Looking at the ingredients from my soup bowl during the tasting session, I could not help but wonder if there was any other secret ingredients not seen. Generously laced with oatmeal and the distinct taste of fried egg white, the Boston Lobster will be the highlight in the coming month of April. Totally awesome! Totally unlike the typical zichar kind of oat and cereal prawn thingy. ♡ This is a league on it’s own. Watching the skillful removal of pincer shell amazed us how easily removable the succulent meat in the pincer was. Boston Lobster will be sold at $11.80++ per 100g during the promotional period. From far even before the dish could reach our table, I could tell that my favourite fish is coming up just from the design of the bowl. This seems to be the signature bowl used for serving fish dishes at Peach Blossoms. Hahah! I still remember the vivid tangy and spicy assam flavour from our last visit when Peach Blossoms had the Abalone Set Menu promotion. This time round, Chef upped one notch on the level of spiciness for the accompanying sauce. As Audrey could not stomach the sharp spiciness of the Spicy Bean Sauce, I gobbled up two whole servings of the Silver Cod with no regrets. It is really very, very hot and spicy with the savoury kind, not mala numbing kind. So if you are infatuated with spicy flavour like I do, this one dish will awaken all your sensations without failing to leave you asking for more. This Yong Tau Fu tasted very similar to what my mum makes at home, except that I could not taste the presence of salted fish or fish meat in the minced pork in a typical Hakka style. The broth with was rich in flavour and I must admit that it is more superior to my mum’s simple soya bean + ikan bilis soup. The familiar “chaotah” bee hoon was given a touch of elegance with the abundance of shredded duck meat stir-fried to smokey fragrance. With the use of a mixture of glass noodles and vermicelli, it is one final stomach-filling dish that should not be missed even after all the fulfilling dishes prior. To make the meal complete, this Duo Dessert Combi of Chilled Coconut Jelly with Mango Puree served with Coconut Ice Cream and Deep-fried Glutinous Rice Ball filled with Custard and Salted Egg Yolk is here to find their way into your tummy. To conclude the meal with the most perfect ending, start from the right with a medley of sweetness and work your way all the way to the left for the finale burst of savoury salted egg yolk lava encased within the very sticky, very QQ glutinous rice ball. This is by no means a hastily prepared dessert as can be seen that the efforts have been put into plating. Every dish was beautifully plated and served hot. I went into food coma when the spoon was finally laid down. Call (65) 6845 1118/1111 or email peachblossoms.marina@meritushotels.com. We are grateful for the opportunity to be invited for a sumptious lunch at Peach Blossoms, for the purposes of this review. We were not remunerated monetarily for the review, all opinions and experiences remain our own alone. All photos unless otherwise mentioned are copyright of Peach Blossoms and were provided for the purposes of this review. All other photos remain the copyright property of SAys! Happy Mums and may not be reproduced without prior notice or written permission given. Marina Mandarin Singapore is a world-class, 5-star luxury hotel that offers breathtaking views of Marina Bay and the financial district. Enjoying an excellent location in the heart of the city, the hotel has direct access to the Marina Square Shopping Mall, and is opposite the Suntec Convention & Exhibition Centre and The Esplanade–Singapore’s premier performing arts centre. The hotel is also perfectly situated right on the trackside of the annual Singapore Grand Prix Formula One race. Meritus Hotels & Resorts is a Singapore-based hotel management company under the Hospitality Division of OUE Limited (SGX-ST: “OUE”), a diversified real estate owner, developer and operator with a portfolio of iconic properties in prime locations in Asia and the United States. As an award-winning hospitality brand, Meritus has been providing guests its signature Asian Grace, Warmth and Care for over 40 years. With hotels and resorts strategically located in key cities and idyllic sanctuaries in Singapore and Malaysia, Meritus is soon extending its footprint in more locations around the region, particularly in Southeast Asia and China. Meritus Hotels & Resorts is three-time winner of Most Popular Heritage Brand at the Singapore Prestige Brand Award (SPBA), demonstrating its impact as a home-grown Singapore brand that has become an important benchmark for values and best practices that other local brand owners strive to attain. More recently, the Group was also conferred Global Winner – Luxury Hotel Chain at the World Luxury Hotel Awards 2013. For more information visit www.meritushotels.com. 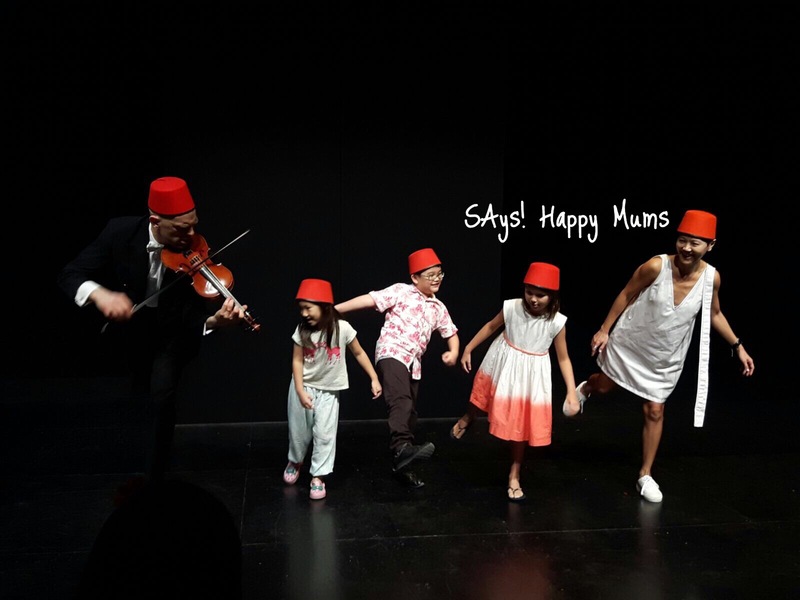 This was the very first time we’ve gone to the theatres not for a drama but for a musical treat and the kids loved every minute of Crazy Classics with Sid Bowfin at the Drama Centre Black Box last Sunday. All set for Crazy Classics with Sid Bowfin! You may be thinking, really? Can classical music really be fun… and for kids?? Well, I had my doubts before going this weekend and the children were the best judges. Every little one was enjoying Sid’s fun easy going way with the Classical pieces. He fiddled on his violin to the delight of the small audience who were clapping ,tapping along and having pure 60minutes of fun. I liked that the show was held at the Blackbox Theatre, a small cosy setting that made it all the more intimate and interactive. It didn’t feel intimidating (even though it was classical music haha)! Before midway, Sid Bowfin had already gotten the children on their feet and dancing to the classics he was belting out. Sid Bowfin seemed to make classical music accessible even for the littlest one or the most clueless one that had zero musical background. He talked to his audience, interacted and told us stories of each piece he was about to play. He made everyone laugh easily with his funny expressions, crazy antics and jokes. The audience participation was unending and there was no lack of volunteers as hands waved up and down to be picked. I was happy to see Wey very enthusiastic throughout the performance. He was trying his best to be picked as a volunteer. LOL! It has always been a big regret for me when Wey stopped music lessons last year because we just couldn’t quite find the time; with him being in the afternoon session in Primary school. Although I’ve heard him tell me that he wants to restart music once he gets to morning session, I was not sure that he meant it. And yet last weekend, I saw the twinkle in his eyes as the music played on, and yes perhaps, next year, he will go back to music again, when time permits. 🙂 In fact, I wouldn’t be surprised if many of the children at the show are already asking for violin lessons, thanks to Sid Bowfin (aka Adrian Garratt). Even though the theatre is small, do note that it is free seating so get there early to get better seats. In any case, Sid does make an extra effort to go to his audience, even those seated behind got to be up close and personal with him so no one gets left out. Also, if you care to stay on after the performance, you can have family pictures taken with Sid Bowfin for that precious keepsake. Our groupie with the crazily hilarious Sid Bowfin! Yay! If you have a budding musician at home or just want to introduce and inspire the little ones, Sid Bowfin will certainly be a fun way to do it. 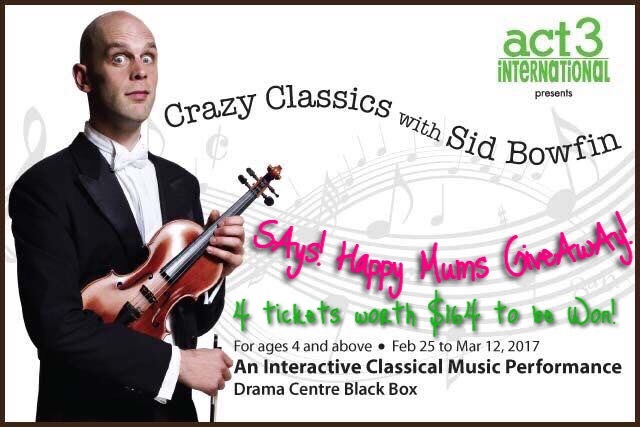 Crazy Classics with Sid Bowfin is presented by Act 3 International and runs at The Drama Centre Black Box Theatre from 25February – 12 March 2017. Tickets are available from SISTIC, http://www.sistic.com.sg/events/ccrazy0317 more details at the end of the post. We’ve been super busy with the kiddos and school since the New Year started and then Chinese New Year came upon us so quickly!! Finally now a chance to breathe after the preparations, parties and gatherings! 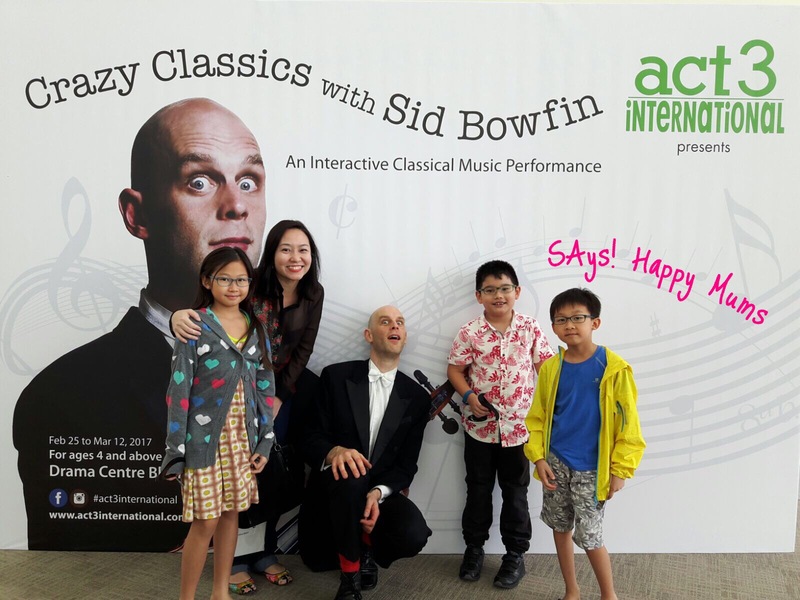 We are so excited again because ACT 3 International is bringing Crazy Classics with Sid Bowfin from 25 Feb – 12 Mar 2017 at the Drama Centre Blackbox. Tickets from SISTIC, book early http://www.sistic.com.sg/events/ccrazy0317 …. Watch for our review for the 26th Feb performance, something tells me that the kids will have a great time with this somewhat different kind of theatre. So what is Crazy Classics with Sid Bowfin? If you haven’t already heard yet, it’s an interactive classical music performance! Do I hear you gasp yet? This performance will be great to inspire and introduce our little ones to classical music, in a very fun and crazy way. 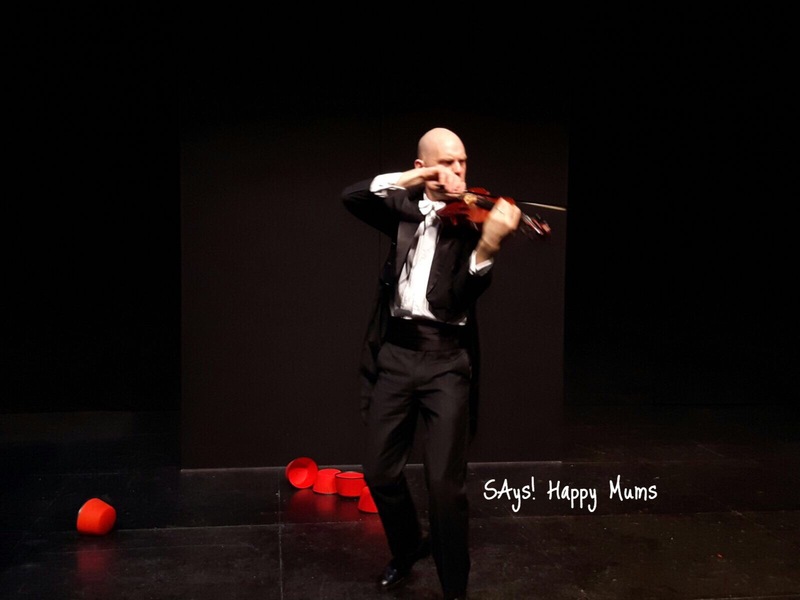 Suited for 4 year olds and above, Crazy Classics with Sid Bowfin is a brilliant high-energy combination of classical music, recital, stand-up comedy, audience interaction and even a clown routine. Sid Bowfin is a very talented comical musician that promises to bring your kiddos and you on a crazy rollercoaster ride of laughter, music and great fun! Sharing his love for the great classics, Sid will play famous tunes from composers such as Mozart, Vivaldi, Rossini and Pachelbel as well as surprise you with some very unexpected pop hits. And hey, if you and your child enjoy listening to what Sid is playing, he might even pick YOU to help him spread his joy! So set a date with your little ones to go on this mad journey of musical wonder with Sid Bowfin now, before tickets are totally sold out! Now here comes the super great news! WIN a Family Package of 4 Tickets worth $164! Thanks to our sponsors, we have a SET of FOUR (4) tickets to Act 3 International presents Crazy Classics with Sid Bowfin worth over $164, for our readers. 1 lucky reader will get 4 tickets to the show on 25 February, Saturday 2:30pm. Yay!! 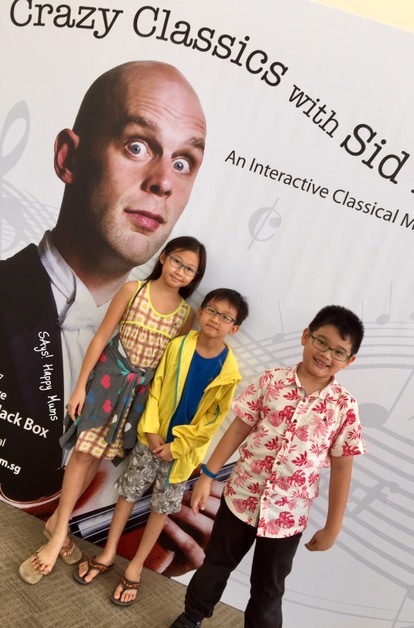 So bring along your family for a great day of crazy fun with classical music ! Do follow ALL the instructions below to take part for your chance to win! 2) LIKE SAys! Happy Mums and Act 3 International on Facebook. 3) LIKE and SHARE this Facebook post with the caption “Tag @Friend A Tag @Friend B Tag @Friend C Tag @Friend D Tag @Friend E, I want to watch Act 3 International’s Crazy Classics with Sid Bowfin with @Says Happy Mums ”. DO set your post to PUBLIC so that we are able to verify your entry. Giveaway ends 20 February 2017, Monday at 2359 hrs. Our heartiest congratulations to our winner for fulfilling the requirements in the above giveaway! We will be in touch via email with regards to prize redemption details. With Christmas behind us and the Year of the Rooster arriving fast and furious in 3 weeks, everyone is always doubly busy with spring cleaning, putting up decorations, banking, and not to forget, meal-planning for reunion dinner and CNY gatherings at this time of the year. If you have not done any planning yet, now is the time to make your reservations at AquaMarine for a gathering this CNY. Located at Level 4 of Marina Mandarin, the Halal buffet restaurant is easily a crowd-pleaser with their splendid spread of delectable cuisine from Asian and International countries. With planning in advance and innovative twist to the usual fare, Executive Chef Tony Khoo and Chef Chan Tuck Wai have specially prepared a line up of festive dishes to celebrate the joyous festival. At the Yu Sheng DIY station, grab for yourselves as much treasures as you can with AquaMarine’s Signature Yu Sheng with fresh Salmon Sashimi. After all, the more one grabs, the more ‘huat’ one will be right? Presenting our top vote, these crepe-wrapped roasted duck and wok-fried leek was a champion both in aesthetics appeal and tastes. Rather than sampling small portions of the same duck and leek from the boring-looking warmer, this pancake-style alternative using healthy buckwheat for a wrap gave us a very different gastro-perience (if there is such a word) right out of from the buffet table. This is a MUST-TRY! Served as the stunning highlight during CNY Reunion Dinner (27 Jan 2017) is fresh Whole Abalone, Sea Cucumber and Lobster Dumpling swimming in a pool of deeply-flavoured Crustacean Sauce with a tinge of spice. Everybody’s well-loved abalone and sea cucumber are braised to perfection – soft to the bite yet there is a little bit of firmness to them. Together with the large chunk of lobster in the big dumpling symbolising a large money sack, I wished I could have another serving to lick the plate clean! Gimme MORE, pretty please! This Wagyu Beef Short Ribs Kong Bag Pau with 8 Spices has been cooked slowly for 16 hours to obtain tender chunks of beef with deep, flavourful gravy to soak steamed and ever soft lotus bun with. An unique twist to the pork belly that we are used to, the wagyu beef kong bah pau is flavoured exactly like how we love it – thick, savoury gravy and (fatty) beef. The addition of soya bean sprouts and lettuce matches the sinful yet delish dish very much. Think fresh, sweet and succlent seafood from this eye-catching steamed basket of seafood enhanced with the nutritious cordycep blossoms and the fragrance from lotus leaves. Symbolising abundance of laughter and happiness for the coming new year, the flower crabs, large prawns and bountiful seafood catch is a treasure trove to look out for. A word of advice – don’t miss the soup! After sampling the wave of delicious dishes above and not forgetting other food from the rest of the usual buffet spread at AquaMarine, we’d recommend going for a serving of warm mee sua stewed with fresh seafood. The significance of longevity in mee sua is what everyone needs in the new year ahead. The mee sua soaked in all the invigorating sweetness from the seafood and it settled comfortably in our stomachs after a satisfying meal. For the coming Year of the Rooster, AquaMarine’s Mandarin Orange Cake certainly looks all set to welcome a year of prosperity and abundance with a wealthy burst of citrusy sweetness and auspicious fruity taste in every bite. Festive Takeaway Menu is available for download here. Call (65) 6845 1111, email aquamarine.marina@meritushotels.com or visit www.marinamandarin.com.sg/dining for more information. We are grateful for the opportunity to be invited for a sumptious lunch at AquaMarine, for the purposes of this review. We were not remunerated monetarily for the review, all opinions and experiences remain our own alone. All photos unless otherwise mentioned are copyright of AquaMarine and were provided for the purposes of this review. All other photos remain the copyright property of SAys! Happy Mums and may not be reproduced without prior notice or written permission given. It has been almost three months since I last updated about the painting of base coat for my walls and ceiling by Nippon Professional Painters at the new house and other renovation issues. Seriously, how come I did not realize so many weeks has passed? I can only remember packing and cleaning, packing and cleaning. And I am not done with it, yet. After my carpentry works was completed, Nippon painters popped by again for the top coat painting. If you asked me whether it was worthwhile to let the professionals do the painting instead of doing the DIY way, my reply would be, yes totally worth it. Why? Read on to find out more. The week I was more certain of the completion of carpentry works, I scheduled with Nippon’s Project Manager, Alan to fix my appointment. With that date locked into my renovation schedule, my carpenters worked hard enough to complete everything for me in good time. I must really thank them for that as Alan had only about 1 or 2 slots available for me by then. It is year end season and Nippon Professionals are almost fully booked. It was pretty exciting to see spanking new tins of paint labelled with the chosen colour codes and names as they were carried into our new house that morning. No longer was there a need to be suspicious over whether brand new paint was delivered, or if the requested colours were substituted with similar shades or brand like what I mentioned in this post earlier. It felt really good! The day started with Alan going through the painting scheme with the lead painter. As he went from room to room specifying the colour coding, the lead painter will use a masking tape to label on the particular walls so that any of the three painters around the house will know which colour to use once they see this label below. Nippon Odour-less Easy Wash in Remembrance (NP OW1053P) for Living/Dining & bedroom walkway. We chose this ultra gentle shade of grey because my hubby fell in love with a photo from Nippon’s Paint Catalogue (Colour My World 2016). Being grey, it fitted our choice of colour scheme for the house very well as well. I was initially worried that the masking tape will peel off the base coat layer and in fact, anywhere else in the house because my neighbour’s room floor laminate skirting got peeled off like paper when their contractor removed the flooring protection. Yes, this is how lousy developer-supplied floor laminates is now. Made in Germany too! Bleh! Alan quickly assured me that they only used Nippon-approved masking tape for all their painting works. The adhesive on the tape is of high quality and will not peel off wall paint, carpentry or floor skirting laminates. Upon comparison with those masking tape my contractor used, I found the quality to be indeed different. To simply describe it without looking into any technical specifications, Nippon’s masking tape is just sticky enough to stick, but does not leave behind stubborn glue stains and is not too sticky when peeling it off. Something like 3M’s Stick-It notepad but stickier. As Alan went about his business from literally wall to wall, the other two painters were already busy doing protection works for the carpentry and other house accessories. These plastic drop cloths came in really good size of 9ft x 12ft (3m x 4m). One piece can easily cover over a full-width full-height window or carpentry works like my bed head. There was no need to “join” pieces together – so convenient and smart! Right before they start work, they went around the house to sand down rough surfaces once more although they already had done it before painting of base coat. I was really happy with their meticulous work. Professionals 就是 Professionals! As usual, the first step to painting is to paint around the electrical fixtures using a small brush. Nippon Odour-less Anti-Mould Celing White was applied onto the ceilings throughout the entire house. I don’t need to worry over flaking paint or mouldy ceiling for a long, long time now even though I stay close to the riverside and I don’t like having bathroom windows open throughout the night for fear of creepy crawlies invasion. Flaking paint ready to peel off (and at the patch near to light source, my hubby repainted it himself). Even the small width of space where my curtain pelmet is, was not overlooked. This is how it looks like after paint around the electrical fixtures is applied. Once the critical areas were covered, they covered the entire ceiling and walls using standard sized paint brush. This was when the guys could work really fast covering wall after wall within few hours. They took their lunch rest after covering the entire house with first layer of top coat and resumed work to apply the second and final layer when the first coat of paint was dry enough. The following few photos will show the different colours of the completed paint job. Nippon Odour-less Easy Wash in Lilac White (1138) for my Master Bedroom. The high gloss is the result of freshly-painted first layer. When it dries, it becomes a low sheen that allows great washability for families with kids. Nippon Odour-less Easy Wash in Mint Scent (NP OW1066P) for the kids’ study area and library. Experts say green is good for the eyes and I need to keep cool with the minty colour when I guide them on learning! Completion done for Study Room by mid afternoon. Isn’t this colour so soothing for the eyes? Nippon Odour-less Easy Wash in Blue Swirl (NP OW1068P) for walls and Winning Streak (NP BGG1566P) as feature colour for windows. The happy didi was proud to have his own room (but not sleeping on his own) in his chosen colours here. Nippon Odour-less Easy Wash in Remembrance (NP OW1053P) for the bedroom walkway and living/dining area. Nippon Weatherbond in Linen White (BS10B15) is used for my balcony that is so exposed to outdoor rain and shine because there is no provision for windows. True to product specifications, the Nippon Odour-less Easy Wash has totally no paint smell. Throughout the day, I did not detect any odour. As you can see from some of the photos, I felt safe to bring didi along for inspection works after school hours. With it’s anti-stain formula for twice the washability over the classic original “Easy Wash with Teflon”, it is great for homes with children. This works for homes which are still being lived in while doing repainting works because it does not inconvenient home owners and there is no need to avoid the home for days just for the paint smell to be fully gone. I heard from a new neighbour who DIY-ed that it took them 2 days just to complete the ceiling. After 4 days of painting, the couple could not take it any more and roped in their friends for help to complete the work. Comparatively, all it took for Nippon to complete their job was only 6 hours for base coat and 1 day for top coat (2 layers) for my 4-bedder unit. 3 painters were deployed for each appointment. With my hubby busy at work and myself going solo on the defects and renovation coordination, I was glad to have Nippon coming on board to help with the neck-breaking painting works. With the painting done, I could arrange for the move-in of furniture together with the start of serious packing up at my old house. It was nightmare part 3 *sniff*. Many many weeks later, my family shifted over to the new house with 46 boxes (by the mover) and probably 10-15(?) by myself before we decided to let the mover take them. We originally thought that we could manage the non-bulky items on our own especially I come to the new house on a daily basis. It turned out to be too much for us and for just an additional of $150 on top of the fees for bulky items, I happily let them have my money! Nippon Weatherbond in Linen White (BS10B15) – View into my house from the main door. Nippon Weatherbond in Linen White (BS10B15) for balcony and Nippon Odour-less Easy Wash in Remembrance (NP OW1053P) for Living/Dining. Nippon Odour-less Anti Mould Ceiling White for the ceiling in my mini wet kitchen and yard (not shown) that hardly allows for 2 pax to work in it smoothly. Nippon Odour-less Anti-Mould Ceiling White for all 3 bathrooms. Nippon Odour-less Easy Wash in Lilac White (1138) for Master Bedroom. I’m loving the new mattress bought from King Koil warehouse sale that gave me the much-needed rest at night. Nippon Odour-less Easy Wash in Mint Scent (NP OW1066P) in the very-not-ready Study Room. Boxes are still everywhere with books waiting to be sold off or to have a space found for them. Nippon Odour-less Easy Wash in Blue Swirl (NP OW1068P) for walls and Winning Streak (NP BGG1566P) as feature colour for windows for didi’s room. We sold off the Single-sized mattress and left the room as a play room for the kids at the moment while we took the time to decide on a new storage bed in either Queen or Super Single. Nippon Odour-less Easy Wash Blue Swirl (NP OW1068P) for walls and Green Rhythm (NP BGG1060P) as feature colour for windows. This room with Queen-sized bed is right now functioning as the bedroom for both kids until we can decide on the use of didi’s room. I provided the respective colour code for references purposes. However due to different lighting condition and screen setting, actual colours will appear slightly different from the photos I posted. It is best that you request for a copy of catalogue sent to your preferred address via normal post. I received my copy in the letterbox within a week. Alternatively, you can request for a free colour consultation and quotation from the Nippon Paint Professionals by calling 6319 7222. Nippon is currently running a very special promotion right now for painting packages signed on or before 27 Jan 2017. With free gifts, free additional colour, free upgrade for ceiling paint and discounted sealer coat packges, they even allow payment by 0% interest free instalment now. Not only these, stand to win RWS staycation packages (5 winners) with every painting package signed up too! If you have been procrastinating, there is no better time to give the home a fresh new look than now. As for the labourious task of shifting and doing protection to the furniture, let the professionals do it! Thank you for reading this post and joining us on SAys! Happy Mums. If you enjoy reading our blog, please follow us on Facebook for the latest updates. We hope to see you back again soon. I am deeply grateful for the opportunity to experience the Nippon Professional Painting Services package. 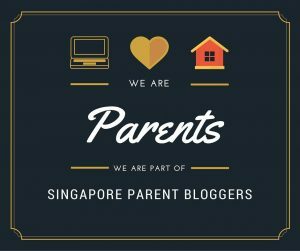 This post concludes the 3-part feature review in the collaboration with Nippon Paint Singapore. We were not remunerated monetarily for the review, all opinions and experiences remain our own alone. Photographs unless otherwise stated are copyright of Nippon Paint Singapore. All other photos remain the copyright property of SAys! Happy Mums and may not be reproduced without prior notice or written permission given. What comes to mind for you when it is Christmas season? We visualise smokey-grilled steak, roasted turkey, honey-baked ham together with images of exquisitely-made confectionaries and sweet pastries. And not to forget that ohhh-so-pretty yule log cakes too! It’s the time of the year filled with joyous mood along Orchard Road where everyone tries to make the most fun out of the year end festive celebrations. Let’s see what Mandarin Orchard has geared up for the yuletide season with their exciting line-up of festive dining promotions and Christmas goodies for everyone! We were most privileged to attend the year-end Christmas party held at Mandarin Orchard and had the opportunity to sample first-hand some of the most gastronomically delightful Christmas Goodies at the party. Filled with dizzying array of mouth-watering Christmas roasts and sweet pastries fit for the season, you can expect to feast into sweet and savoury culinary delights at the various restaurants at Mandarin Orchard and festive takeaway booth between 23 November to 31 December 2016. New creations such as Baked Norwegian Salmon Fillet with Watercress Crust, Roasted London Duck with Chinese Herbs, and Red Velvet Yule Log; and signature comebacks such as Premium Honey-Glazed Gammon Ham, and Valrhona Delicious Dulcey Yule Log will be available for a party with friends at Coffee & Crust, Level 5 or takeaway from Festive Booth, Level 1 Lobby. Credit Card discounts ranging from 15-20% off for EARLY BIRDS is valid for orders made/purchased from 23 Nov to 14 Dec 2016. Thereafter, normal discounts apply with 10-15% off. Look out for special offers for Citibank and DBS/POSB cardholders! For the full Christmas Takeaway Goodies form, please download at: http://tinyurl.com/MandarinGoodies2016. For order and enquiries: Tel: (65) 6831 6272/6320 or email: festivedesk.orchard@meritushotels.com. Happening yearly at Triple Three, their lavish Christmas and New Year buffet spreads aim for the utmost in gastronomical delight. For quality meat cuts and exceptional dessert and pastries, we’re always satisfied after all the indulgence. Triple Three has prepared their Signature Pineapple Honey Glazed Ham, Roasted Stuffed Turkey with Cranberry Sauce, Mentaiyaki Lobster, and luscious festive desserts such as log cakes, stollen and fruit cakes for this season’s celebrations. Discount: Ranging from 1-for-1 for lunch and 50% off every second diner (dinner) for early bird pre-paid bookings made before 16 December 2016 for Christmas and 28 December 2016 for New Year’s Buffet. Please call to enquire. Mandarin Orchard’s Cherry & Hokkaido Cream Fairy Tale Log is a must-try this year! Both visually appealing and yummilicious at the same time, this will be the perfect adornment for the party table this year. Dusted with Matcha powder over a tiramisu log cake, this is another exceptional creation with complementing flavours to delight. Surprisingly not tough to the bite, the roasted turkey was in fact juicy and succulent. I went straight for the thigh meat. Kids would love it the tender meat too! Never made to disappoint, the roasted Black Angus Rib Eye has always been a delight to dig into. Don’t miss this at the Triple Three buffet too! Another roasted dish that we love is the Beckshire Pork Rack with Yuzu-Himalayan Salt Crust. A uniquely sweet and savoury mix of flavours from every bite, the pork rack is a sure crowd-pleaser. Don’t say we never jio! We are grateful for the opportunity to attend Mandarin Orchard’s Christmas Party for the purposes of this review. We were not remunerated for the review, all opinions and experiences remain our own alone. All photos unless otherwise mentioned are copyright of Mandarin Orchard and were provided for the purposes of this review. All other photos remain the copyright property of SAys! Happy Mums and may not be reproduced without prior notice or written permission given. If you have a talented little one with a dream to take the stage and be a star, here’s an opportunity to do it with a stellar theatre company, Pangdemonium! Pangdemonium is casting for their production FUN HOME! Pangdemonium’s “FUN HOME” is holding auditions on 29 December 2016 for three child roles. Getting cast in this Tony-winning Broadway musical could be a dream come true for any young musical theatre actor! The casting call includes protagonist Alison Bechdel’s youngest stage incarnation and her two child brothers: Christian and John. CHRISTIAN is the oldest Bechdel child. Young male actor aged 10–12. JOHN is the youngest (age 7–9), and described as being full of energy and having a quirky imagination. Both roles call for a young singer-actor with a natural sound, good sense of harmony, and pitch. YOUNG ALISON (age 9-11) holds much more heft in the show than her two stage brothers—original cast member Sydney Lucas earned a Tony nomination for the role, after all! She’s “on the cusp of finding herself and forming her own views on how a girl her age should behave and dress”. We are looking for a young girl who is both confident and intelligent. The right candidate’s singing abilities will require moving “seamlessly in vocal quality from speech to song” and a range of B to B. * Please note that in the story, SMALL ALISON is considered a “tomboy”, and becomes aware that she is not like most other girls her age. She sings a song “Ring of Keys” (https://youtu.be/pMAuesRJm1E) about this growing awareness, but otherwise does not understand, much less know how to act upon, what she is sensing. It is not until she reaches her late teens (MEDIUM ALISON) that she dares to come out as gay. With this in mind, auditionees (and their parents/guardians) have to be comfortable with the subject matter of the story. Please note that we will NOT transpose on the spot. Minus-1 will NOT be accepted.